How do you know what type of fiber optic cable you need when there are what seems to be endless options? Well, you’re in luck… Corning, alongside Accu-Tech, can help. But first thing’s first… let’s begin with dissecting outside plant cable and the best uses for it. Proper cable selection is critical to the intended long term performance of the communications network. 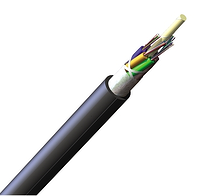 Outdoor cables are designed to protect the optical fibers from weather elements like UV, rain, wind, heat and cold. Some outdoor cable applications have to withstand high tension and rigorous installations including aerial, duct, or direct buried. Basic construction elements include black UV-protected polyethylene cable jackets designed to protect against the rigors of both weather, installation and daily use. Outdoor cables can be either all-dielectric (no metallic components) or metallic armored to improve overall cable protection. If armored, cables must be grounded appropriately. Inner construction varies based on fiber count need and termination method. When considering flavors of outside plant cable, there are two types of constructions: loose tube and ribbon. See the table below introducing Corning's ALTOS cable. Loose Tube Construction - Fibers are “loose” in colored buffer tubes meant to allow the optical fiber to safely expand and contract with a wide range of temperature changes. Optical fibers and buffer tubes will be 1 of 12 colors, per industry standard, with maximum fiber counts up to 288 fibers. These types of cables are typically terminated via traditional fusion splicing. Ribbon Cable Construction – Typically 12 or 24 optical fibers are matrixed side-by-side in a “ribbon” pattern and permit much higher fiber counts. Cables of this construction can reach 1728 total optical fibers. As with loose tube, these types of cables are also terminated via fusion splicing but require specialized ribbon fusion splicers. But what are the three flavors of fiber optic cable? Stay tuned for the next blog on Indoor Cable!